BLUETOUCH Bluetooth Car Kit Is Not So Hands Free | OhGizmo! By Andrew Liszewski on 03/14/08 • Leave a comment! Most bluetooth car kits are designed to let you operate your cellphone without having to use your hands, but the BLUETOUCH also provides the option of using a large touch screen instead. While it might seem a bit redundant, the touch screen buttons on the BLUETOUCH display are considerably larger than what you’ll find on a phone, including the iPhone. So finding and hitting the correct one while behind the wheel is a bit easier. And even though it includes a touch screen, the BLUETOUCH also has full voice control when it comes to the telephone functionality, whether you speak English, German or French. But that’s not all. 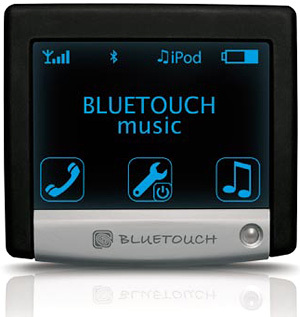 Besides making calls, the BLUETOUCH also allows you to stream MP3s from your phone or iPod (with the appropriate accessory) to your car’s stereo including track info and playback control. However if your phone only has enough memory to hold a handful of MP3s, the device can also load music from an SD/MMC card or a USB flash drive. At $399 it’s definitely not the cheapest option if you’re only looking for a hands-free calling solution, but if you want to add MP3 support to your car it’s somewhat reasonable given the large touch screen.